Roadmap is where you set your vision and goals, initiatives and milestones so everyone are aligned on where you’re going. Your roadmap supports planning using OKRs, 6/6/6, Dateless, GIST or your customized preferences. 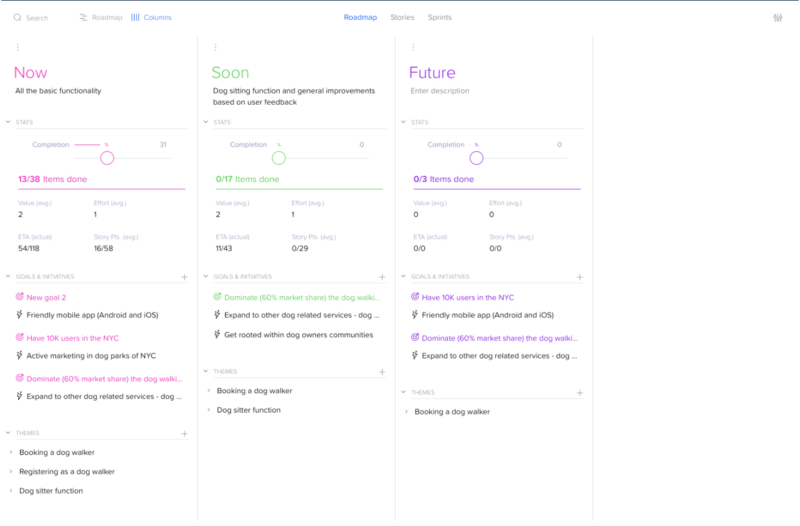 You can also customize the terminology of your roadmap via your product settings, and use the roadmap settings and layout options to set it up in pretty much any way you want. 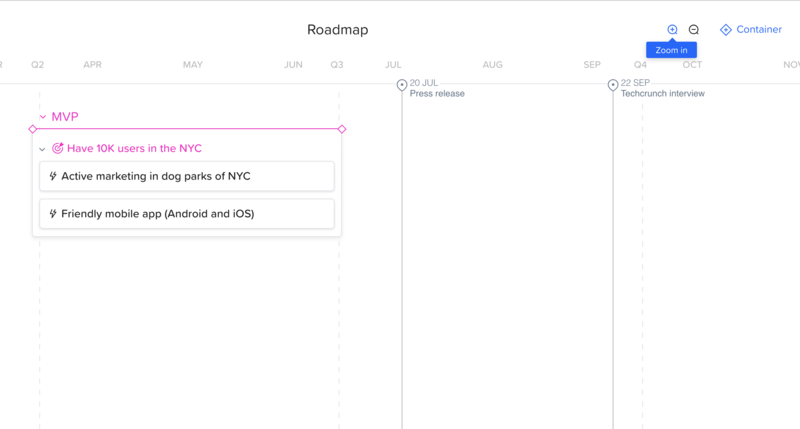 You can set view your roadmap as a timeline view (That’s the 1st time default view) and side-by-side columns view. When in timeline view, you can select more than one product using the portfolio dropdown. 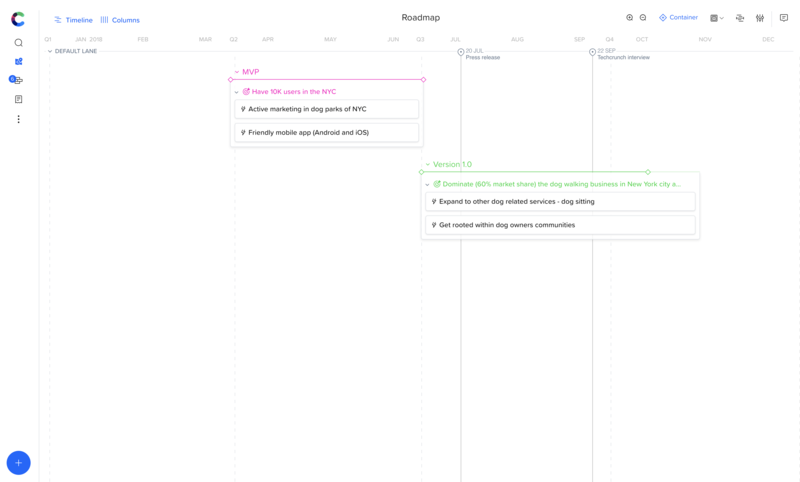 When in timeline view, you can drag and drop containers into different position, row or lane. You can also drag and drop goals and initiatives inside and between containers. For any container, drag and drop its box borders to resize its appearance, or drag and drop its “diamond” edge to set its duration. To add a milestone, just roll your mouse over the milestone top line and click at the place you want to add your milestone at. If you prefer to work at a dateless mode, you can name 3 containers with the popular ”Now”, “Soon”, “Future” naming, and view them in column view for a better overview of your vision and planning. To set your roadmap start and end points or dates or to extend your canvas, switch off dateless mode and set a year start and end. 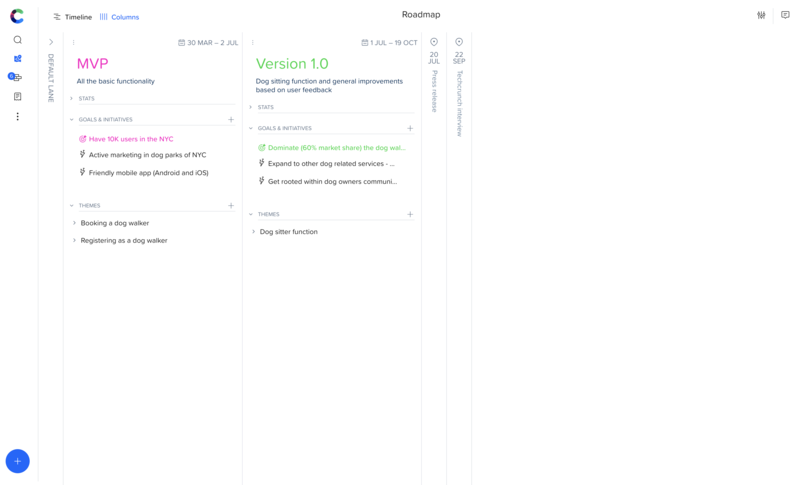 When you visit your Roadmap workspace for the second time and after, Craft will remember and load your last view. You can view a timeline of all your Craft products simultaneously. 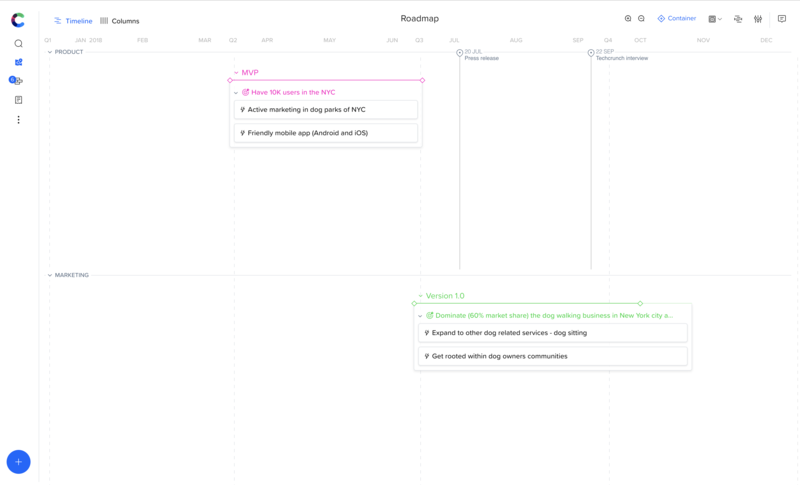 For that you need to go to Roadmap > Timeline of one product and select other products from the portfolio icon on the top right of your workspace. Your roadmap starts off with a Container -> Goal -> Initiative hierarchy, you can change this terminology from your product settings. Containers - are the high-level entities which you create goals and initiatives in. Containers can be named as releases or just a title for everything in it (i.e “MVP” or “Release 3.1” or “Q1”). You can easily set the color of a container using the 3 dots menu and add notes and ideas to it using the braindump icon. A container can have many goals, and goals can have many initiatives. Milestones are a lightweight entity you can add at the top of each lane. It consists of a name and a date (when the dateless setting is off). For example, a milestone can be a meaningful company event or a conference you are going to attend or present in. Craft allows a powerful organization of your roadmap with lanes. You can create as many lanes as you want to set your containers a part and give them a more meaningful categorization. For examples lane names, can be “Infrastructure”, “Marketing Campaigns” or “Front End Development”. You can connect your product stories and requirements to your roadmap by connecting them to an initiative. When you connect your stories to an initiative, Craft will ask you to choose the Container -> Goal -> Initiative you want to attach the story to and by that connect it to the correct container. You can view all your container’s stories, their epics and themes in the container panel, where you can filter your definition by Goals and Initiatives and set your container completion percentage.